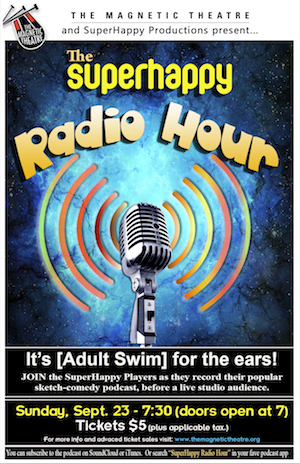 What is The SuperHappy Radio Hour? It's sketch comedy for the podcasting age! Every month, the SuperHappy crew take you back to the glory days of live radio with adventure, comedy, and stuff that's just weird. Some of the best comedic talent in Asheville take the stage for a live, radio style show – recorded for podcast. Irreverent, unpredictable, and very funny! [Adult Swim] for the ears! You can subscribe to the podcast and download or stream from SoundCloud, GooglePlay or iTunes. Or... search "SuperHappy Radio Hour" in your fave podcast app!